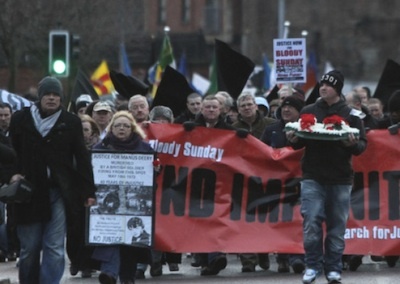 Despite freezing conditions, over five thousand people attended the annual Bloody Sunday march this year to commemorate the massacre of 14 civil rights demonstrators in Derry in 1972 and demand an ‘end to impunity’ for those responsible. The following is a transcript of the address by former MP and civil rights leader Bernadette McAliskey, from the Pensive Quill. Thanks very much. I wasn’t really quite sure where to start here today. It’s good to see so many people here. I thought actually that Kate was going to read out some of the thanks to people before I started but she’s going to do that afterwards. It has been a lonely enough path at times for families. There are times when people who are in the thick of what is actually happening - the people who have actually have suffered the brunt of the pain and the loss - who have to travel very lonely paths sometimes - although we try our best to stand with everybody. So here on the forty-first anniversary of Bloody Sunday I’m actually surprised myself that on this cold day that somewhere in the back of my head is a slightly-too-close for me at the minute a very uncomfortable memory of standing here forty-one years ago. Sometimes you forget as well why we came on that day. It’s very important to remember first of all that we continue to fight - to challenge the cover-up, to challenge the pattern, to challenge the belief that the state can do whatever the states likes. And even though some people from time to time get tired or begin to collaborate with the state in believing that it’s all best swept away somewhere and new starts made on corrupt beginnings. We still have to keep in front of people’s minds that it didn’t just happen to us. Bloody Sunday is not exclusive to the people of Doire - not exclusive to the people of Northern Ireland. Had many of you had the opportunity, which you didn’t, to be at some of the events yesterday, and hear Jenny Hicks speak of the loss of her two daughters at the cover-up in Hillsborough, to hear Dave Douglas speak about the cover-up of the attack on the miners, to hear Susan McKay speak on the cover-up of sexual abuse of innocent children who were supposed to be safe in the care of institutions and were violated there. That’s why it cost alot of money. That’s why it took alot of time. And as one of the people and I still say - I never asked for that Inquiry...I never wanted it...that’s my personal stand...I never wanted to go to it because the man who was sitting there, decent human being though he was, was an employee of the government I saw murder people in front of my eyes! It took all day yesterday in the High Court for a very brave lawyer to keep battling against David Ford and we’re not supposed to say this because David Ford asked the judge to insure there was no reporting. Well...I don’t work for the media...so I’m not reporting... I’m just telling you! But in the High Court, on a judicial review, the judge said that David Ford’s behaviour and his judgment on not allowing Marian Price out - and not even considering it - for a few hours to sit by the coffin of her sister was unlawful, unreasonable and irrational. That’s what the judge said about the Minister of Justice of this small, misbegotten, corrupt, little, pretending state. When we talk about people on hunger strike many young people here forget that when Marian Price and Dolours Price were on hunger strike it wasn’t that they were fasting - they were force fed in that manner for every day for [two] hundred days - and it destroyed those young women. It destroyed their physical health and still the state not satisfied. We came here forty-one years ago to demand (the end of) internment without trial. We came here forty-one years ago to make it perfectly clear that if Her Majesty’s government - Her Majesty owns the government - if her Majesty’s government in the United Kingdom of Great Britain and Northern Ireland could not insure that this part of her jurisdiction was governed openly, transparently, democratically and within the dictates of fundamental human rights and freedoms - which should be extended to people in prison - which should be extended to people who should not have their liberty removed from them except by due, open process of law - then this place should not be governed by Her Majesty’s United Kingdom government. We stand today looking at a new dispensation, people still in prison, the people in these houses - people who live here - no housing executive after a few years! No welfare state! No health! No benefit! No civil rights! No nothing! We have got to get our act together. We have got to do a bit more than just march. We have got to organise. We’ve got to educate ourselves. We have got to get moving or there will soon be nothing here for anybody. Let’s look at the endurance of the families who have held this fight. Let’s look at the endurance of Marian Price and Martin Corey and the others and let’s say to ourselves: we have got to get a political programme together here and get the struggle for civil rights, political rights, social rights and economic rights together or we are in, comrades and colleagues, for one hell of a hiding. Thank you very much.